Please visit Springhouse’s Art Gallery Cafe to view our most recent exhibit, “Nature’s Beauty” by local artist, Judith Robichaud. The exhibit features oil paintings of birds, fish, and landscapes. As described by the artist, “My recent work focuses on birds that range from the common, unappreciated ones that we encounter everyday like sparrows and pigeons to more exotic fare. 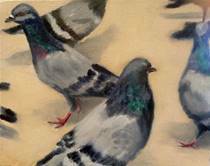 I find beauty in the grays and browns of these birds especially placed against uncluttered backgrounds.” Ms. Robichaud works in “alla prima” style where she attempts to complete a painting in one session. The spontaneity of this style results in sense of accomplishment with every trip to the studio. Ms. Robichaud’s work will be on display through October 19th.